There’s a fine art to making the best tasting cup of coffee- it isn’t just about the beans and technique. If you want the best tasting coffee, you need to start with the best equipment. That’s why we’ve reviewed the best coffee machine with grinder options. Grinding your own coffee is the first step to creating the best brew- most coffee enthusiasts appreciate this, and buy coffee beans that they grind themselves, just like their grandmothers did. If you’re in this camp of coffee enthusiasts, then you’ll need to buy a grinder as well as a coffee maker. You have two options for this: either buy a separate coffee maker and grinder, or you can buy the best coffee maker with grinder included. A 2-in-1 combo! There are many coffee makers with grinders included, so we want to make the buying process easier for you. 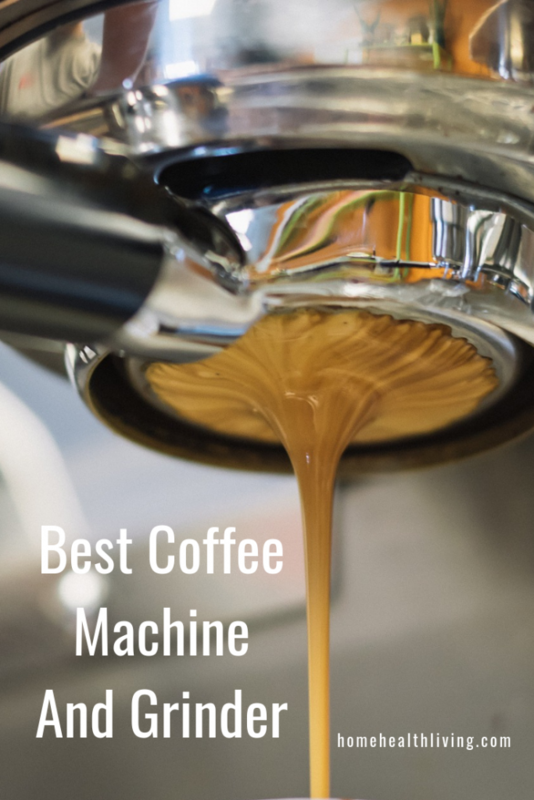 We’ve researched and tested a bunch of different brands and models to bring you a comprehensive list of the best coffee maker with grinder option. Buying a coffee maker with grinder is the best way to save space in your kitchen. It also allows you to simplify the process of grinding and making coffee- the machine can do both at once. There are other great benefits and features of using the best coffee maker with grinder. We’ve reviewed the best machines for you, so you can choose the one that’s going to give you the most value for your money. 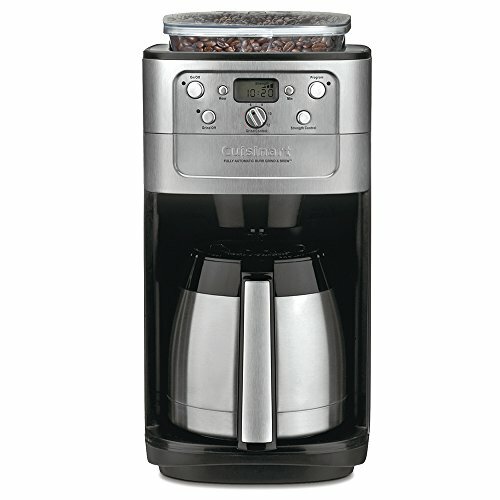 The Cuisinart DGB-900BC is our pick for the best coffee maker with grinder. It’s a best-seller on Amazon and consumers are very happy with its features. 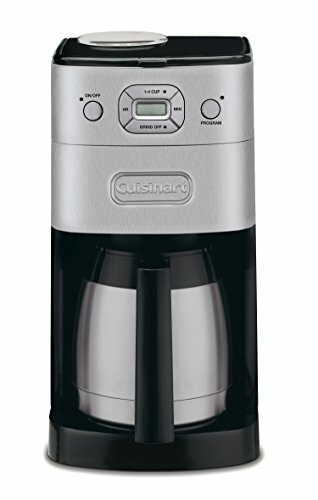 The Cuisinart makes 12 cups of coffee and has a 24-hour programmable feature, so you can set and forget your coffee making tasks. You can choose your coffee strength- mild, medium or strong. The built-in automatic burr grinder holds half a pound of beans. The bean hopper holds 8oz and has a sealed lid to prevent moisture. You can choose between 2 to 12 cups to grind. The machine automatically shuts off when its done, so you don’t need to remember to do it yourself. If you don’t need to use the grind feature, you can turn it off. There is a brew-pause function that lets you pause the brewing so you can pour yourself a cup of coffee before returning the carafe to continue brewing. The thermal carafe is double-wall insulated stainless steel that has a grip handle that’s easy to hold. The carafe can keep your coffee hot for a couple of hours. The machine contains a charcoal water filter to filter impurities out of the water. The coffee filter is a commercial style gold tone filter. The only downside to this machine is that it can be a little tricky to keep clean, and requires you to buy a special brush to clean the chute. It also doesn’t have a hot plate, but the double insulation of the carafe does keep your coffee hot. Krups is another well-known and popular brand with coffee enthusiasts, which is why we have chosen it as one of the best coffee maker with grinder brands. It’s slightly cheaper than the Cuisinart, which makes it more appealing. 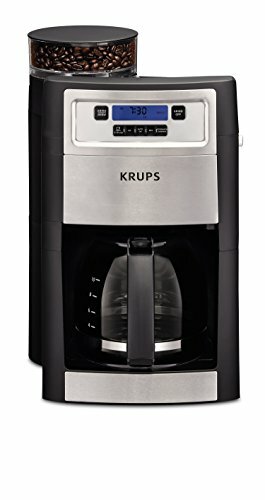 The Krups Grind and Brew Auto-start coffee maker with burr coffee grinder makes between 2 and 10 cups of coffee. You can program the machine to start brewing at whatever time suits you- you can wake up to a fresh pot of coffee every morning. There’s an LCD display that lets you easily see the options you choose. You can choose your coffee to be mild, medium or strong. There’s a pause feature to pause brewing while you pour yourself a coffee then return the carafe to continue brewing. This way, you don’t need to wait until the coffee has finished brewing if you’re brewing up to 10 cups. The keep-warm feature keeps your coffee warm for up to 2 hours so you can brew a pot in the morning and have it ready for morning tea time. The conical burr grinder lets you choose whether you want the beans ground to a coarse or fine finish- there are 5 settings to choose from. 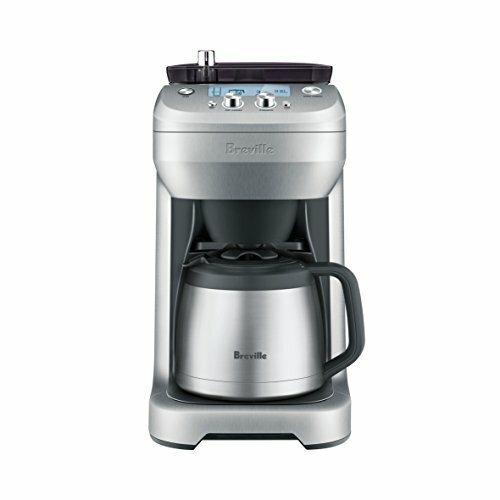 The Breville BES870XL coffee maker isn’t for the faint hearted. This is not a coffee maker that you can just set and forget. If you’re someone who wants to unleash her inner barista and don’t mind getting your hands a little dirty, then you will love this machine. The machine is semi-automated. This means that you can choose to have an automatic set up for your machine, or if you want to customize your coffee, you can manually choose the different options to make the cup of coffee you prefer. The four coffee elements that you can manually choose are the coffee dose, temperature, pressure and steam. Most automatic coffee machines use a dose of 11-13g of coffee however for a full bodied flavor, you need 19-22g of coffee, which the Breville Barista Express allows you to choose. The Barista Express has technology that ensures your coffee is brewed at the perfect temperature, and adjusts the temperature if it changes during the process. 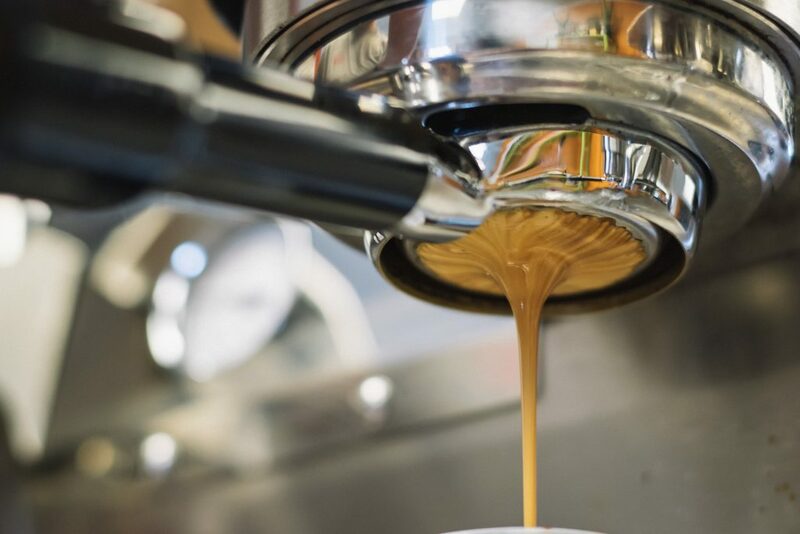 To give you the perfect coffee crema, the Barista Express pre-infuses your coffee beans and uses low pressure to make sure the coffee is evenly soaked and expanded. The automatic steam wand creates the perfect steam pressure so that you’re left with velvety smooth milk for your coffee. The steam wand can be swivelled 360 degrees. The Thermocoil Heating System is a cast aluminium block around a stainless steel tube, which gives you a quick heat up time. The conical burr grinder is in-built and lets you grind only what you need for your coffee. You can also pre-set whether you want a single or double shot of coffee. There are two dual-wall pressurized filters for those with less coffee making experience, while for the budding baristas there are two single-wall non-pressurized filters so that you can experiment with the grind sizes and pressure. We love that the Barista Express’ 15 bar pump was manufactured in Italy. The machine has a cup warmer on top so you can warm up your cup before brewing your coffee. It can also remove the moisture from your used coffee grind so that it dries up quickly and makes the clean-up process easier. The removable drip tray has a section for wet spills and a section for dry spills, and lights up to let you when the tray needs to be emptied. There is a one-year limited product warranty. The Cuisinart DGB-650BC is the smaller version of the DGB-900BC which we reviewed at the start of this post. It has similar features to the 900BC but is a smaller size. This is great if you have a smaller kitchen and don’t have much countertop space. The machine can brew 10 cups at a time but you can choose to brew less coffee- between 1 to 4 cups is possible. 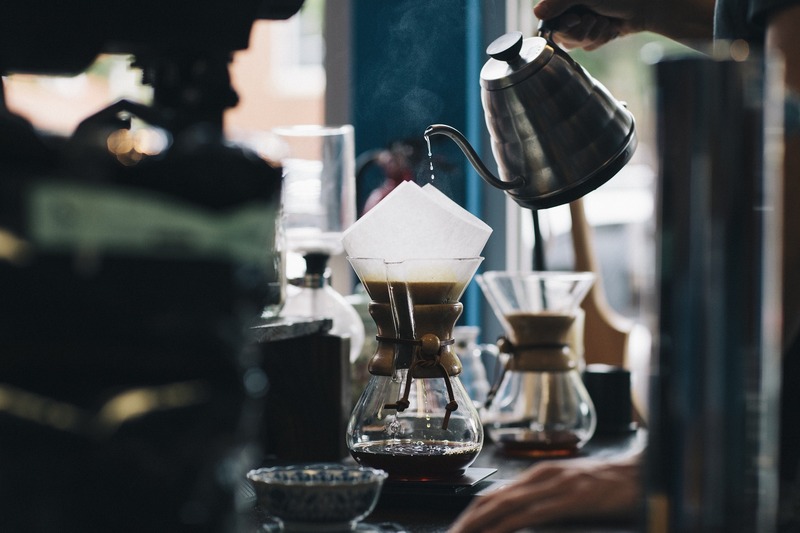 Reducing the amount you brew won’t impact on the quality of your coffee. You can program your machine to have your brew ready when you wake up in the morning. The thermal carafe is double-walled to keep your coffee warm for a couple of hours. You could brew a cup for first thing in the morning, and have coffee ready for your late morning brew. Don’t want to wait for the machine to finish brewing? You can pause the machine to pour yourself a cup before continuing the brewing process for everyone else in your home who’s waiting for a coffee. Once the machine finishes brewing your coffee, it shuts off automatically. DeLonghi is a well-known and popular coffee maker brand, with a variety of high quality coffee maker with grinder machines, with features to help you brew the perfect cup of coffee. The Italian-made ESAM300 Magnifica gives you 5 drink options: espresso, cappuccino, latte, hot water (for tea) and Americano. The burr grinder has 13 adjustable options for grinding your coffee beans the way you like it. The second chamber allows you to use pre-ground beans- you can choose regular, specialty or decaf. You can customize the settings on the machine so that your coffee is made the way you like it– the machine remembers your settings for next time. This saves you having to re-enter your preferences. You can choose the temperature, coffee strength and cup size. 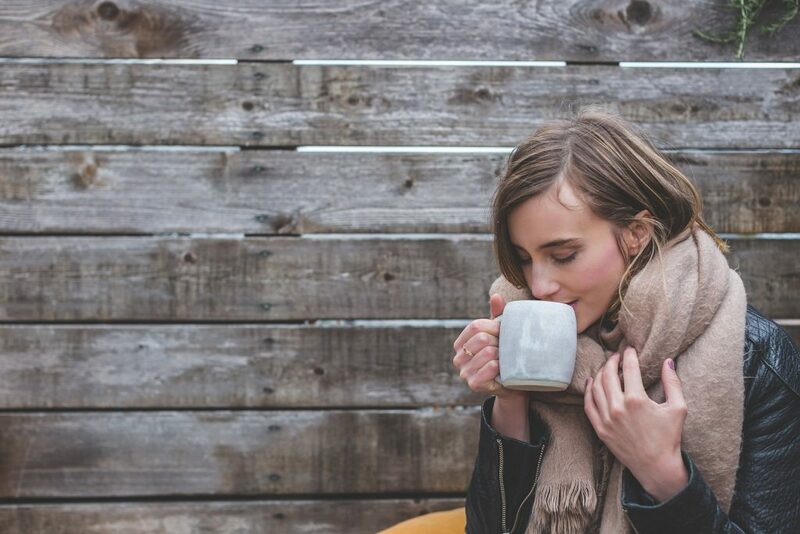 To keep your cup warm while your coffee brews, there’s a warming cup tray to play your cup on. Whether you use a traditional espresso cup or a tall mug, the spigot height can be adjusted. The patented milk frother “cappuccino system” is a manual frother, with the wand able to rotate 180 degrees. This is helpful when you use different sized cups and need to move the wand to fit into the cup or mug. The brew unit is compact and extractable, making it very easy to clean, unlike other coffee makers with multiple parts. It has a descaling indicator to let you know when your machine needs to be descaled. The parts that need to be cleaned can be easily removed from the machine. The bean container capacity is 8.8oz and the machine takes about 75 seconds to heat up. 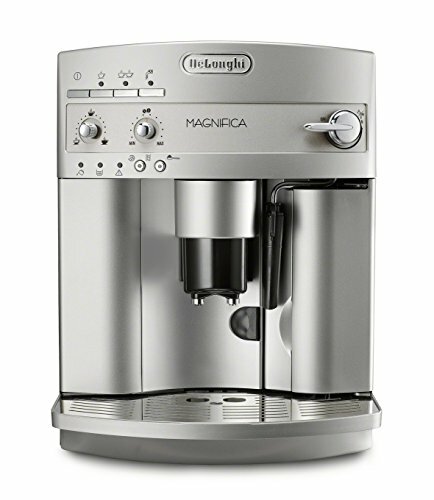 The Delonghi ESAM300 Magnifica comes with a limited 2-year warranty. 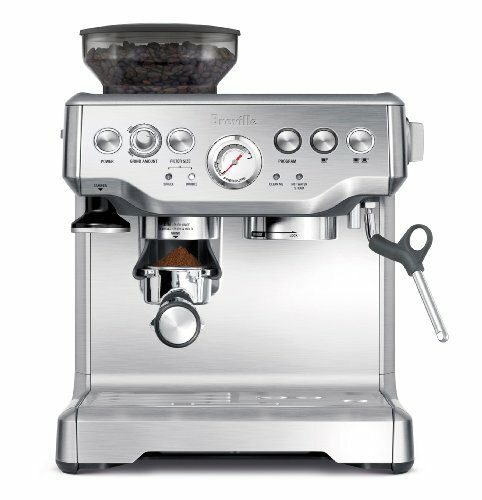 The Breville comes with 8-strength settings, which is the most of any machine we have researched and reviewed. You can choose how strong you want your coffee flavor, or you can choose the pre-ground option if you’re using pre-ground coffee. The coffee grinder has 6 different settings for how fine you want the coffee ground. You can program the machine to brew up to 12 cups of coffee at a time. This is great when you’re entertaining or if you want to use the machine at your office. You can program your machine to the settings you want- it will auto start according to how you set it. The machine has an LCD screen so that you can see your customization selections. This is a great machine to use at your office- it can accommodate different-sized mugs just by removing the drip tray. It’s important to clean the machine at the end of each day especially if you’re using your machine at work. This ensures your machine doesn’t clog up. The cleaning process for the Breville is straight forward. When choosing the best coffee maker with grinder, there are a few things to consider. The great thing about coffee makers is that there’s a great machine at every budget level. Choose how much you are willing to spend, and find the machine that gives you the best value for money. If perfect coffee is important to you, choose a machine that lets you customize your settings. This means, being able to choose the right coffee strength, the temperature and the milk frothing options. Think about the type of coffee you will be making. If you need to add milk, then choose the best coffee maker with grinder that has a milk frother. Milk frothers aren’t all built the same- some machines have better quality frothers than others. You want a machine that’s easily to clean. With many machines, parts need to be removed when cleaning. You want a machine that has parts that are easy to remove for cleaning. You want a machine with easy access to cleaning components. 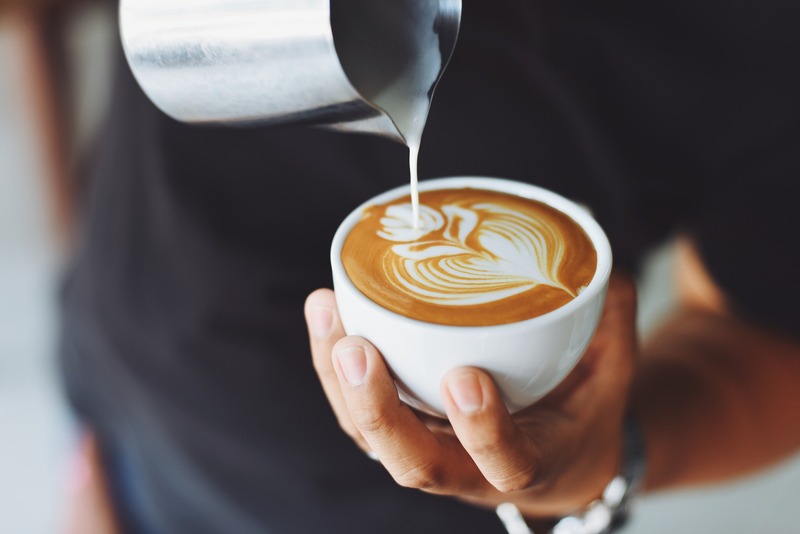 Making coffee is a personal experience- some people are happy with a set-and-forget option without too many customization options. Others are very particular about their coffee and like to have complete control over the entire brewing process. 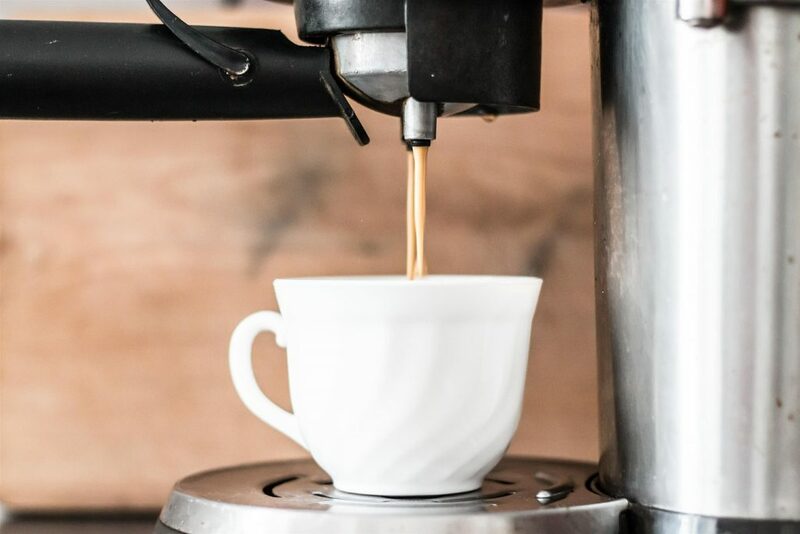 We’ve reviewed different types of coffee maker with grinder machines- some that are set-and-forget, and others that are semi-automatic and allow for manual options for those who love the process of brewing a coffee. Regardless of what you prefer, make sure you choose the best coffee maker with grinder machine that’s perfect for your coffee brewing needs.